Boy troubles. Every girl I know has them. Lately, I’m losing sleep over my boyfriend. It’s an ongoing issue. My close friends know about it, I always turn to them when I need someone to hear me out, to enlighten me with a fresh perspective and especially, to give me some kind of comfort and let me know everything will be ok. If you’ve been a visitor of my blog, you know I love making desserts, mixing and stirring ingredients is like therapy to me. I tried making coconut panna cotta last week when I was feeling sad and planned to serve it with mashed up blueberry sauce. As I unmolded one of the puddings, it belched and melted into a bowl like a lifeless amoeba. My first response was to violently throw the rest of it into the sink, but I didn’t. I hate wasting food, besides, they tasted fine, just not stunning and I wanted to share something worthy. Instead, I picked up rhubarb on the way from the liquor store (I know beer and root vegetables don’t go hand in hand, but they were conveniently located within footsteps to each other and I really needed alcohol that night). 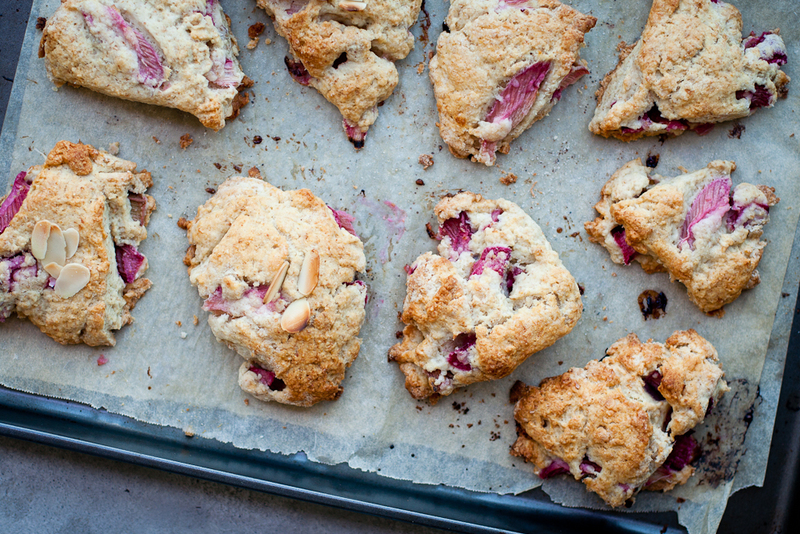 These rhubarb scones turned out way better. They were attractive and smelled freaking awesome. Chunks of tangy rhubarb balance out the richness, they’re sprinkled with just a touch of sugar, the coconut milk gives it a delicate aroma. I even switched out some of the all-purpose flour with whole wheat flour to justify eating more since it’s supposedly healthier. A word of warning, the dough definitely finicky, but if you don’t mind getting your hands sticky with flour, it’s not that bad. It took me a few attempts to shape the dough properly and being in my I’m-so-goddamn-upset-do-not-bother-me mood didn’t make things easier. I love that they don’t look perfect, they’re rustic craggily messes and though they don't have the same effect as chocolate, these do make you feel a little better when you're blue. 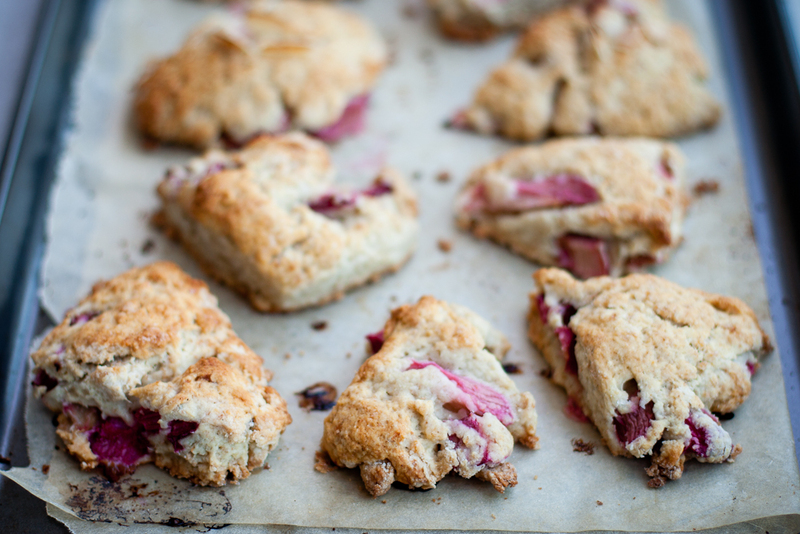 I like these scones fresh from the oven, when they still have that irresistible crusty exterior. 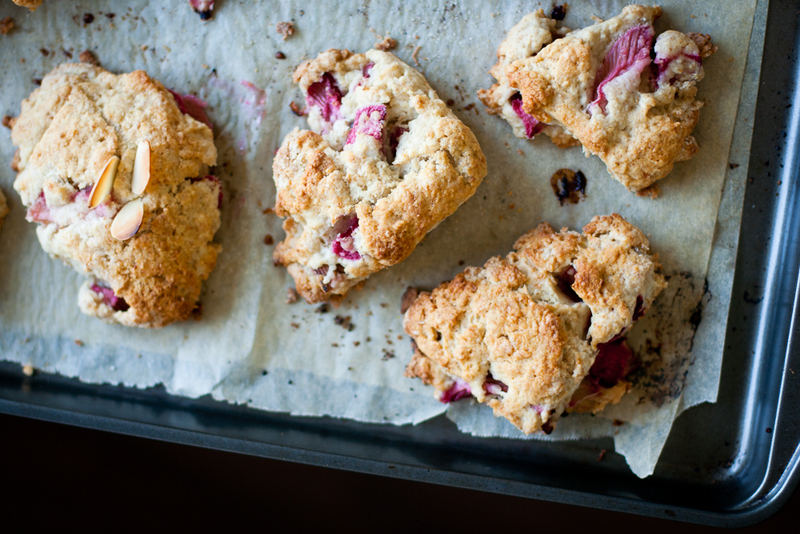 They can be reheated in the oven and taste great on their own, or smeared with strawberry jam. I upped the amount of rhubarb and decreased the baking powder just a little. I also switched out the heavy cream with coconut milk since I had some leftover. You can also garnish the tops with sliced almonds for an extra crunch. Preheat oven to 425°F, set racks in the centre of the oven. Line baking sheet with parchment paper. Cut rhubarb stalks into quarter-inch thick pieces. 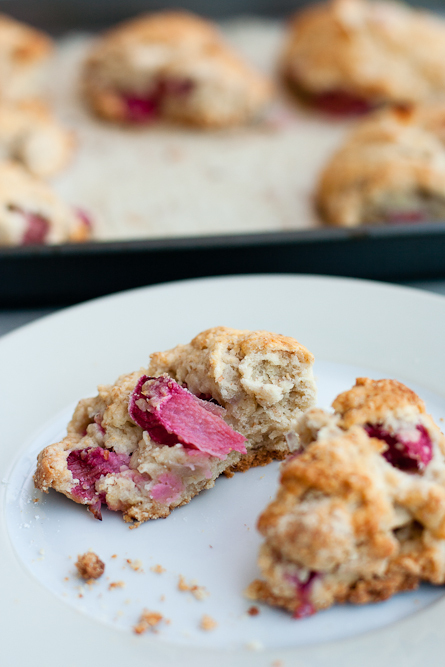 In medium bowl, toss rhubarb with 3 tablespoons of the sugar, set aside. Sift the flour, baking powder and salt together in a large mixing bowl. 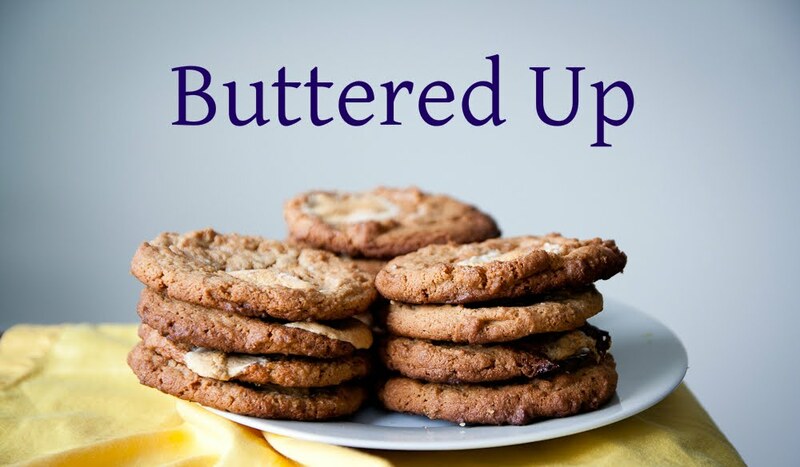 Cut butter into flour mixture using a pastry cutter or using your fingers, rub butter into flour until it resembles pea-sized pieces (or, you can pulse the butter into the flour using a food processor). Add in the remaining sugar and blend in the rhubarb (if you’re using a food processor, you still want the rhubarb to remain mostly intact, so just pulse the mixture). Mix in the cream until a soft dough begins to come together. Transfer the dough to a clean, floured work surface. Knead gently until dough begins to stick together and divide in half. 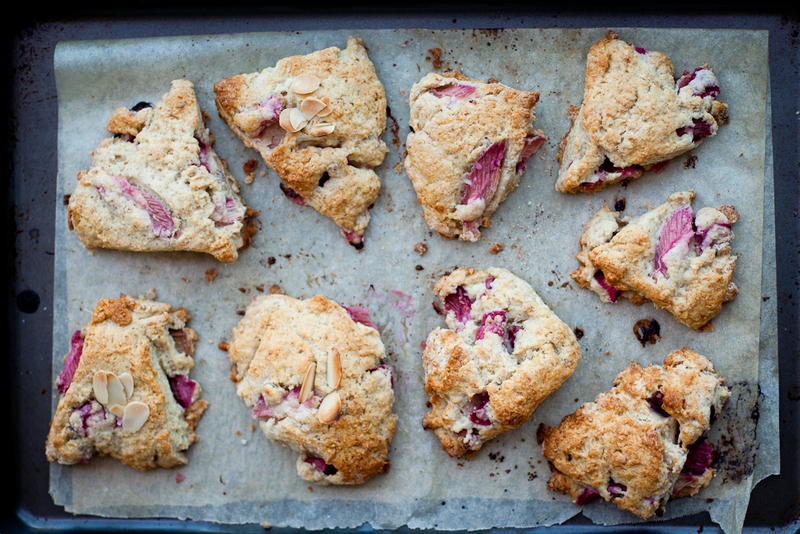 To make triangular scones, flatten into rounds about 6-inches in diameter and cut into circle into 6 or 7 scones. 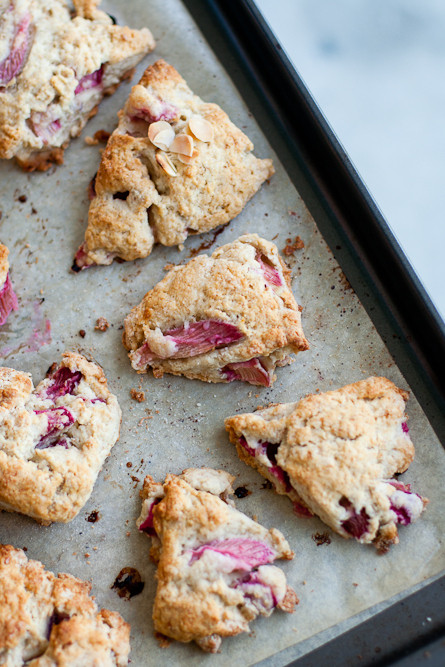 Sprinkle with remaining sugar, transfer to lined baking sheet and bake for 20-30 minutes, or until scones are golden brown.